It's always fun to set David loose with his camera in Primitiques. He has a neat perspective. Just thought I'd share a few of his pics. You can go here to see the rest. 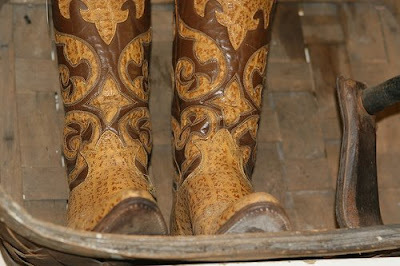 Here's a close up of those Tony Lama boots. And here's a better shot of the dish rack/chicken feeder. Me and my power shot took the rest of these photos. You can go here to see all of the pictures in my Primitiques photo set. I thought I'd show a new use for a locker with the door removed. Great for dishes! I like the look of silver against the wood. 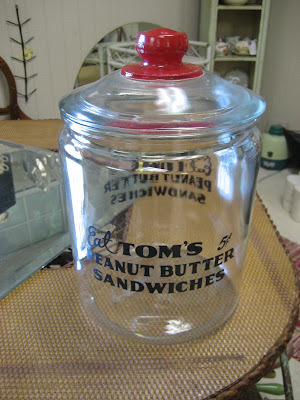 And here's a better shot of that Tom's jar. I thought the math flash cards added a little whimsy to the front of the store. And that architectural piece rocks, doesn't it? 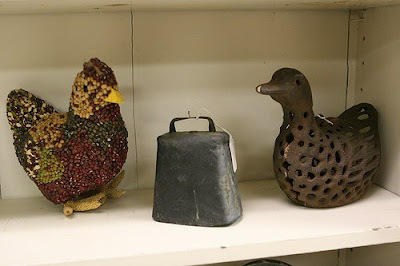 Mindy, I love the chicken feeder dish rack display. Awesome idea!! 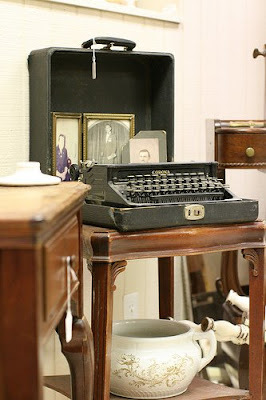 Love the typewriter display! And the flashcards are fab! I love the picture of the typewriter keys. I'd put it in a frame and hang it on my wall. What size are Tony's boots? Yowzer! It all rocks! I'm in love with the chicken feeder and the locker! Love at first sight! Tricia, he is good, isn't he? Cher, David and I turned those boots all but inside out, looking for a size. None listed anywhere! 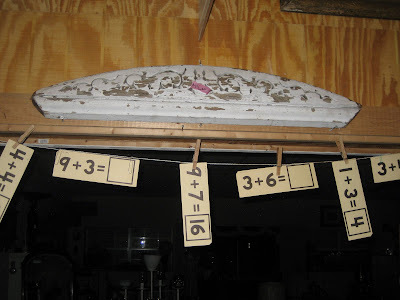 When I am at the store in the morning, I will put them on and see if I can make an estimation. It's about time you came to Poetry anyway, isn't it??? I kept looking at the first picture...cluck, moo, quack...and thinking "where is the cow?" Dang, I am so blonde! 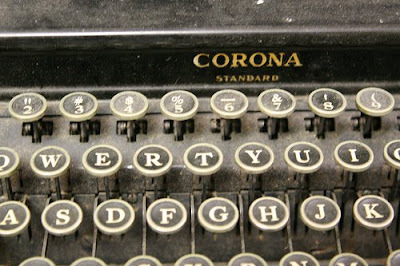 I love the pic of the close up of the typewriter keys! Thanks for dropping by, I have REALLY enjoyed visiting your blog! 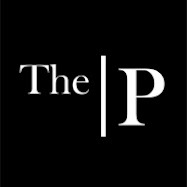 Can't wait to get to Poetry...lots to see and do. 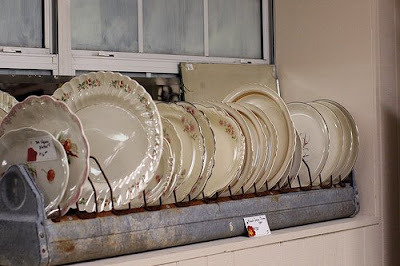 LOVE that chicken feeder dish rack! Is there a series of #, then a letter by chance? I want to shop there! 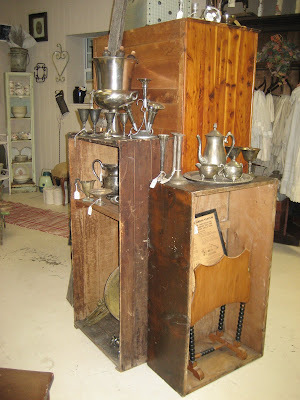 I live in France and everyone wants to come here to do antiquing and I of course want to do th opposite! That peanutbutter sandwich jar is divine! 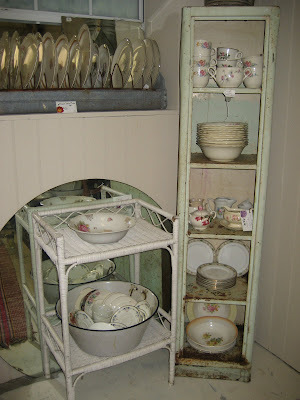 I love the plate rack/chicken feeder.Thanks for stopping by and entering my PIF book exchange. Good Luck! Pretty dishes with pink roses on your feeder. How cute. Are the 2 scalloped edge plates ironstone or china? Kinda hard to tell from here. Ooh do I love that dish rack/chicken feeder! It would look so good in my little kitchen. All the photos are great, now off to your link to see the rest. This looks like a place where I'd like to spend some time and even a little bit of money. That chicken feeder as dishrack was genious.